Happy Birthday Dear Dear~~ ~ Smithankyou - Lifestyle and Travel Photo Blog. Yesterday was dear dear bday.. but i actually celebrated it with dear dear on the 16th. It has been quite some time since dear and i go on "pa tor" session.. most of the time also go out with the rest of the gang , uncle chai , colleague or family. so the feeling is quite good too!! 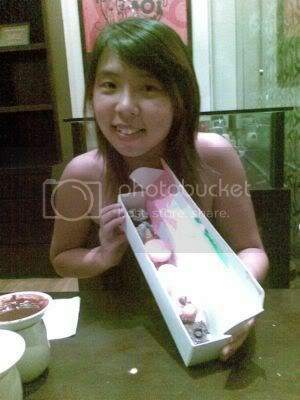 started off the day with bringing dear dear to eat her favourite chocolate fondue!! 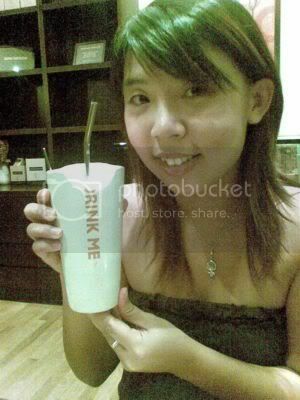 thx to joanna and cynthia who brought me there the last time.. dum dum really enjoy herself..
Dear dear's cup says " Drink Me " .. remind me of SR's friend with the T-Shirt " Squeeze Me" but too bad i lost that pic.. so oh well.. So other den eating chocolate and drinking chocolate i got dear dear some "gobi"
dear dear says i am so sweet.. i also find it so sweet.. until so bth.. drink chocolate.. eat chocolate.. still eat chocolate cake dessert.. hahaha..
look at her hamster face enjoying her gobi..
den we headed down to watch movie - 881.. the movie is nice.. but i will not talk much abt it.. other den if u dun watch.. u are so "techno"..
i saw Xue Jia Yen aka Hao Yi .. she was watching the show in the same cinema as well.. she looks really young for her age.. and i saw lester too.. lester - the jester who works with my company.. nice chap.. so qiao rite? after the movie was a nice walk to mrt and called it a nite.. a good trip.. simple.. normal.. but relaxing..
A nite of drinking.. thx Weekee , eve and Auntie for dropping by and sending wishes..
have to apologies for being not so happy.. as usual.. our mentality of drinking is like Grace ( jacky's auntie ) come out drinking liaoz.. just drink.. dun lan jiao wei gao gao.. sick.. cannot drink this kind.. cannot drink tat kind.. pple help u drink.. IT IS OKAY IF U JI LOR LAI also rike cannot drink.. but when other pple bday u dun go jio pple drink until happy happy den when ur own bday u siam ka dunno which hole of urs.. still rmb why my 21st bday fight?? simply cause of the same reason.. pple lan jiao lang only know how to make pple tar and ownself siam?? best spot of the nite.. Mr.Ma.. we all know it is not ur bday.. but i wanna pwn3d u deep deep for backstabbing me during my bday.. u played along very well.. i respect u..
drinking is fun.. is sumthing we experience.. and is sumthing which pull us together.. we take turn to get pwned.. everyone have their chance.. been there and done that.. it is very chee bye when u pwned pple u laff until song song and pple pwned u or pwned ur love one back u kbkp and angry..
it was a good trip.. good trip..
now time to go eat.. nuff said..